UCY.TV has been on hiatus, and I have had a 2-month break from my weekly production of “On the Brink’ radio broadcasts. But my interviews have not stopped, and my research, art, activism, investigative journalism, and travel have all gone to the next level during this time. In the next couple days I will share a post in honour of Rob, followed shortly by an update on my new art and recent experience, which has brought me from Aotea to Te Wai Pounamu to the lovely island of Rarotonga. This article is by far the single best and most comprehensive writing I’ve ever done about the whales and dolphins. It is not an easily assimilated sound-bite or advert for how clever my (non-existent) non-profit organization is. It IS an in-depth examination of the REAL GLOBAL THREATS to whales and dolphins with all the arduous complexities and terrifying confrontations with a truly ‘science fiction reality’ that must be navigated if we are to approach even a rudimentary understanding. In case the article is truncated in the email, go to the blog and PLEASE READ IT ALL. The images tell a big part of the story, and an exhaustive list of references is on the blog post. (Martin’s note: a few of Jeff’s images and links not in this posting will be found at Jeff’s Blog Post). BLOG POST FOR THIS ARTICLE. (PHOTO: LIZ CARLSON) See in link. GUARDIANS OF LIFE or ‘BIOLOGICAL INTERFERENCE’? ‘Man, the wise’ is waging an all-out war against life on Mother Earth, inflicting imperially-mobilized ‘full spectrum dominance’ across all theatres of engagement. No landscape, niche or organism is safe from the military-industrial juggernaut, regardless of the pervasive la-la land ‘everything is perfect’ dementia characterizing the modern mind-set. Whales and dolphins have been known to strand since the beginning of recorded history thousands of years ago, long before technological civilization began; whatever contributing factors existed then would still exist now, in the same way that ‘climate change’ is as natural as having a climate. Whale strandings, algal blooms, disease outbreaks, bush fires, floods, cyclones and earthquakes are all ‘natural disasters’ that pre-date homo sapiens by many orders of magnitude. So what is different in the world of today? We are living in a world that is vastly interconnected by telecommunications networks that permit nearly instantaneous but highly selective awareness of events distant from us in space and time. We are surrounded by incredibly advanced technologies at every level, yet few of us have sufficient scientific background to comprehend them. We are still approximately the same biologically as we were hundreds of thousands of years ago, but we are increasingly the product of our own engineering. Agriculture and domestication have affected us as much as they have the plants and animals that we enslave. Cultural evolution, ‘extra-somatic artifacts’, scientific ‘progress’ and technological innovation have led us down a path of auto-genetic mutation from which no return is possible. We are the ‘naked ape’ riding a science-fiction roller-coaster that is off the rail. Instead of going walkabout, sharing stories and pondering the mysteries of the cosmos, we spend our time driving, texting and psychically mutating by consuming fiction. Before World War 2 America did not have a permanent arms industry; since then, however, weapons manufacturing and ‘defence contracting’ have become by far the biggest business on the planet, dwarfing the entire ‘civilian economy’ by several orders of magnitude. What Eisenhower called ‘the military-industrial complex’ has expanded to assimilate academia, media, medicine, finance and government so that now we have a globally integrated supra-national ‘new world order’ whose client-states are formerly sovereign nations and whose real enemy is life herself. Since World War 2 human life has been greatly affected by ‘conveniences’ like ‘the peaceful atom’, television, pesticides, pharmaceuticals, personal computers, mobile phones, ‘fast food’ and plastic. In this paradigm of the ‘American Dream’, weapons were a necessary evil only to be taken up for defence of God and country. In the world of today, that everything is being weaponized is a grotesque understatement. Two of the greatest feats of weaponization, however, are almost invisible on public radar, the engineering of the forces of nature and of Mother Earth herself, and the engineering of the human mind and humanity herself. 1) THEY ARE ‘SACRIFICING THEMSELVES’…for US. 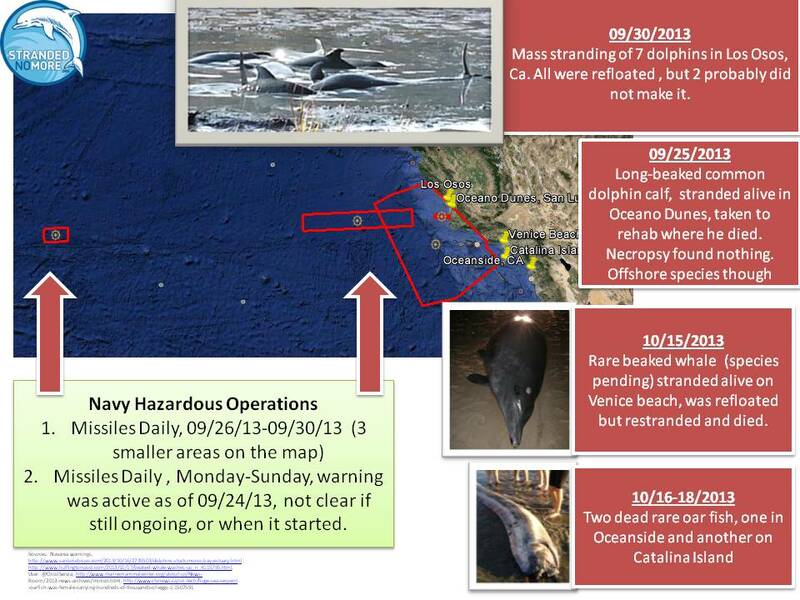 These are some of the myriad reasons that are commonly given for whale and dolphin strandings, beginning with the least believable. In this article I provide in-depth detail on each of these. None of these are of course totally impossible, and ‘truth’ often is stranger than fiction, but (1) and (2) are quite a stretch. (3) is not implausible, as humans are known to do this, given that cetacean consciousness resembles our own in many ways. But group-suicide is rare, if in fact it has ever happened. The Jim Jones and Heaven’s Gate events were more likely mass-murders than suicides. (4) is less implausible, as humans, too, do this, but again, not usually in large groups. Reasons are given that the whales’ sonar malfunctioned in shallow water, and/or that they were traveling through unfamiliar terrain. Given that cetaceans in general have been here for tens of millions of years, and the comparatively slow rate of geological and tectonic changes, this is hard to swallow. 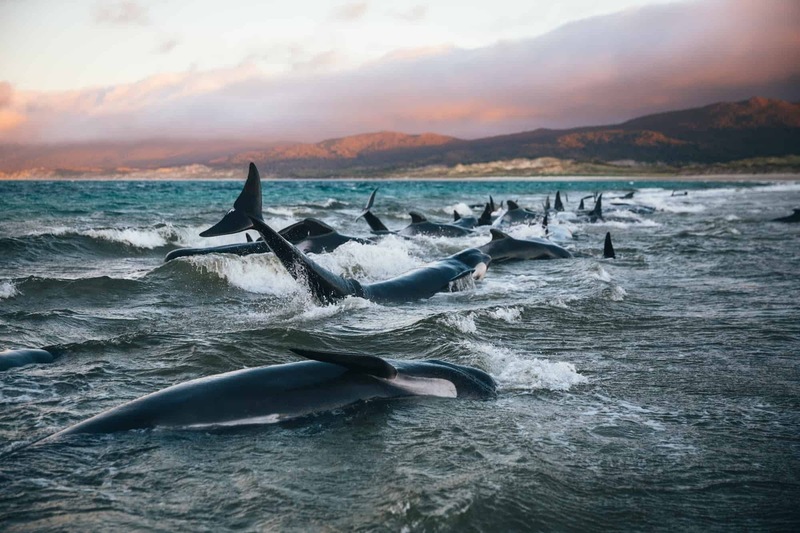 Pilot whales are always noted to be ‘social beings’ who like to ‘follow the leader’ onto the sandy shore? (5), (6) and (7) are natural phenomena invoked as stranding factors. Surely, wind does cause subsurface noise, and solar flares and CME’s can disrupt magnetic fields and thereby navigation, and sea-quakes can make loud sudden noises and generate undersea shock waves. Once again, however, all of these have been the norm since time immemorial, and they don’t just come out of the blue, not for beings whose bio-technologies of sensation and perception are light years beyond ours in terms of bandwidth and sensitivity. Au contraire, I think that cetaceans in general are able to know about what is happening not only all over the ocean and Mother Earth but also in the entire heliocosm, on the sun and planets and beyond, out to other star systems. (8) “Mystery illness” is in wide use as an all-purpose culprit (like it’s cousin “climate change” no one knows if it’s a cause or effect?) and in reality means ‘anything that’s wrong with them that we can’t identify.’ ‘Mystery illness’ as a valid element could be the result of any or several contributing factors, ‘natural’ and anthropogenic, and strandings can have both physiological and psychological origins. For about a decade I have speculated that due to the unbelievably high levels of chemical toxicity that have been detected throughout the world’s oceans, cetaceans might be subject to syndromes resembling Alzheimer’s disease, whose primary effect is neurophysiological and cognitive debilitation. I was saddened but not surprised to learn that signatures of Alzheimer’s were recently discovered in dolphins. “Mystery illness” is as broad and non-specific as ‘cancer’ or ‘schizophrenia’, but cetaceans can and do get diseases just like we do. Many cetaceans are burdened with compromised health but are still able to function, as are many if not most people. All life-forms on Mother Earth are subject to bio-accumulation of systemic chemical and radiological toxins, resulting in physiological and metabolic degradation. Many of these substances are carcinogenic, mutagenic and teratogenic as well. And all of life is being affected by the full spectrum genomic warfare which is the legacy of military-industrial civilization. “compromised health” is far more accurate. (9) “Panic reactions” are probably involved in many if not most stranding events, and may involve several of the above factors. For example, (5) (6) and (7) might combine, exacerbated by (8) to precipitate (4). Here we are still within the realm of ‘natural’ influences, given our belief that diseases and degenerative syndromes have occurred in cetaceans since before human ‘civilization.’ Ultimately, we have no way of knowing. Some whales and dolphins might want simply to die in peace and may strand together so that they don’t have to drown. And what we do not and cannot know is probably far greater than what we think we do know. 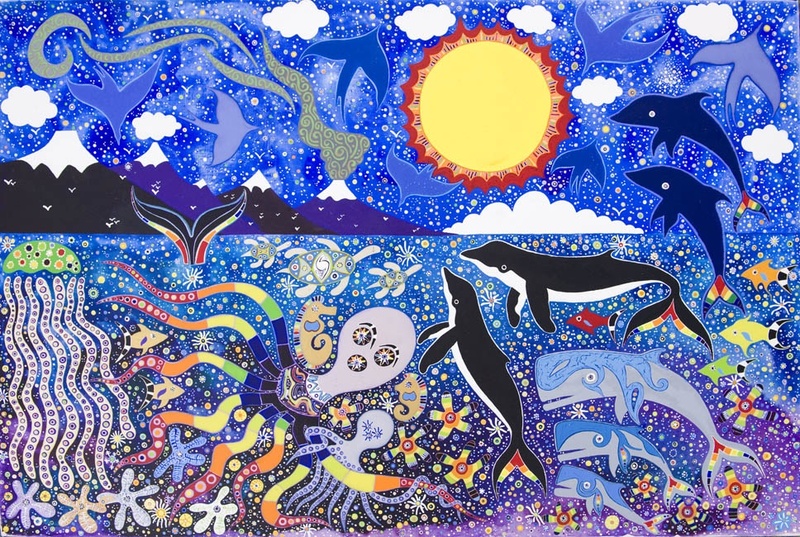 From the perspective of cetaceans as fellow sentient beings (not ‘magnificent creatures’ or ‘beautiful animals’), another possibility exists, the loss of key individuals or entire marine tribes creating a vacuum of knowledge, wisdom and leadership. “It has recently been proposed that whaling might have wiped out so many whales that important cultural knowledge has been lost, along with knowledge about safe traveling routes and possible danger areas. A recent study (Wade et al., 2012)echoed this argument, stating that poor recovery of many odontocetes (toothed whales) since whaling times could be due to the loss of key individuals and, by extension, the loss of important cultural knowledge. 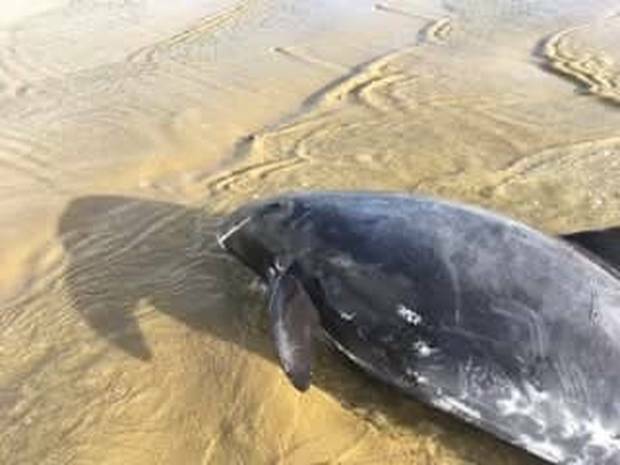 When an entire pod becomes stranded and there are no survivors, this creates a situation in which there is nobody left to tell the story and warn others. 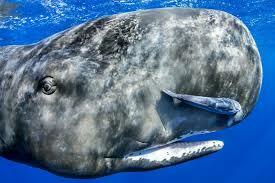 Sperm whales, for example, are known to have such cultural knowledge. Anecdotal evidence exists of large aggregations happening in some areas of the world once every three years. These aggregations could serve various functions, of which information exchange could be one such purpose. In the world of today, in order to understand what is really going on, we must realize that all of the above is happening as much as ever, but superimposed onto this matrix of factors, possibilities and probabilities is a vast spectrum of anthropogenic military-industrial destructive and pathogenic influences which has been metastasizing throughout the 20th century and reaching levels of virulent global saturation in the 21st. Paradoxically, the naked ape on his roller coaster has created this scenario yet is incapable of understanding it…almost as if the juggernaut has a mind of its own? As a whole, humans are almost totally and willfully ignorant of the sheer enormity and complexity of the global military-industrial machine whose tentacles encompass every country, every continent, every ocean, every ecological niche, and every life-form, as a side-effect and by strategic design. Engaging and confronting the existence of this monolithic planetary parasite is arduous and terrifying, yet absolutely essential, in particular the parallel and interdependent paradigms of the engineering of nature and Mother Earth (geo-physical warfare) and of our thought processes and perception of reality (psychological warfare). 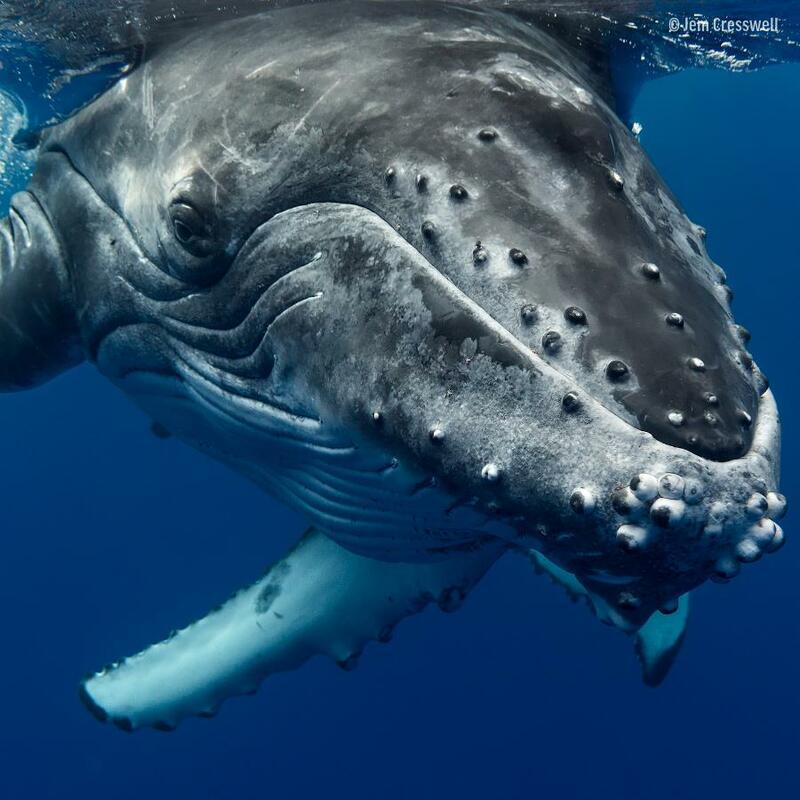 Awareness of these paradigmatic contexts is necessary in order to understand what is happening with the whales and dolphins, as well as our understanding of our understanding, or lack thereof. Dealing with the paradoxical enormity and invisibility of the entire military-industrial apparatus, the socio-economic, political and bureaucratic, the ecological and psychological aspects, is overwhelming. The bigger the elephant in the living room, the more sophisticated are its cloaking devices. The bigger the lie, the deeper our embrace. Mapping this out and creating awareness in the public mind is a daunting and on-going challenge, and represents a big part of my work on behalf of cetaceans. What we really need to focus on is the unfolding of the ‘revolution in military affairs’ that began with the Manhattan Project and has culminated in what we are witnessing today. 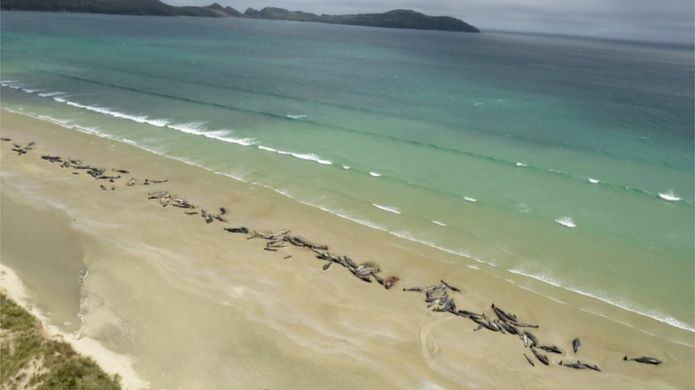 WHAT IS BEHIND THESE STRANDINGS? 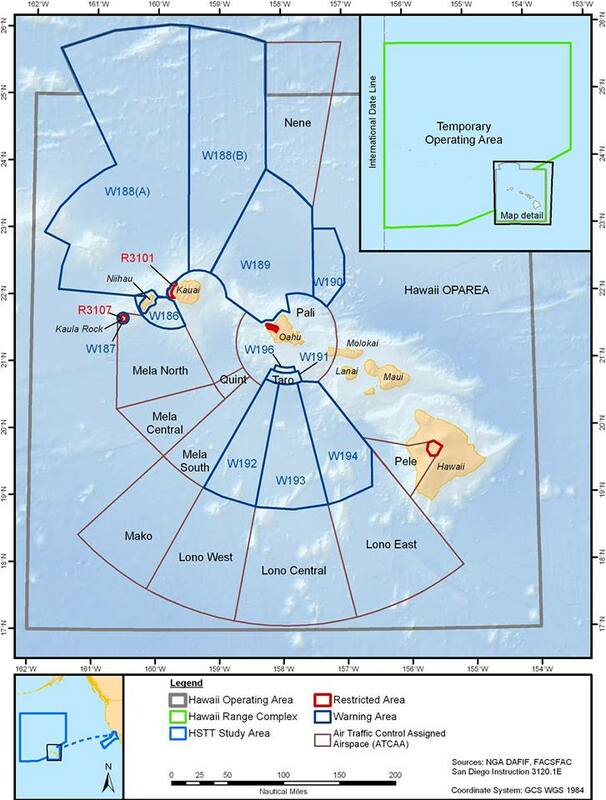 The array of military-industrial threats to cetaceans is systemic and affects large numbers of whales and dolphins chronically through continuous exposure and acutely through intense intermittent events. Even without insider knowledge of specific operations, we can make educated guesses about what kinds of things are likely to be going at any given time in any given location. All the ‘natural’ factors form a background context within which the military-industrial factors occur. 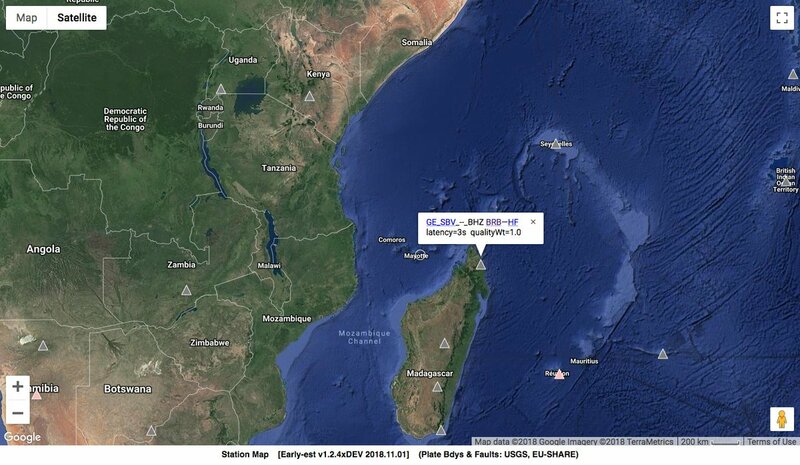 Mapping and quantifying the military presence and influence in Mother Ocean is a formidable task in itself. The global ocean covers 139 million (361,000,000 sq kms) of Earth’s 197 million square miles, and with an average depth of 12,600 feet (3730 m), contains approximately 331 million cubic miles (1,347,000,000 cubic kms) of water. It’s a big place, largely inaccessible, unexplored and devoid of light, but teeming with life even in her darkest depths…and of all life in the ocean, the whales and dolphins are the only ones who can access it all. Increasingly, however, Mother Ocean is being invaded, contaminated, stolen from and irradiated by every possible technology that military-industrial civilization can come up with. The unfortunate reality is that at any given moment, all whales and dolphins may be being adversely affected by any combination of and/or all of the natural and anthropogenic threats we have outlined. This renders any kind of ’cause and effect’ equation untenable. 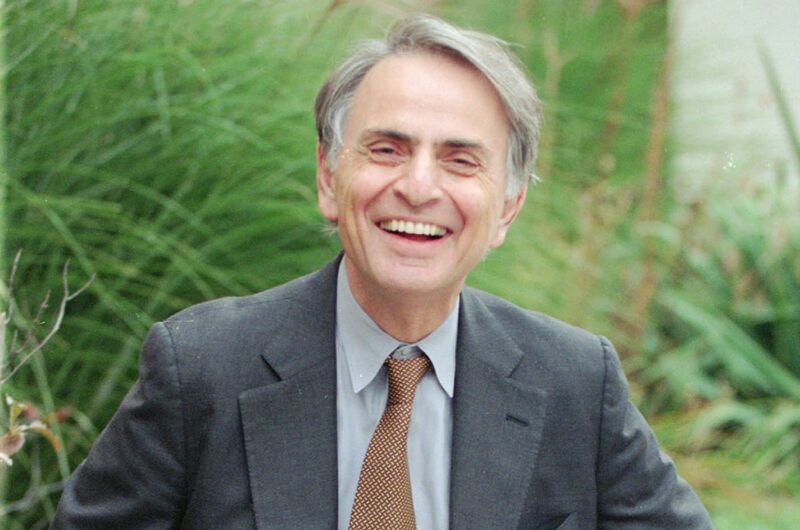 Absolute proof is impossible, but the absence of evidence is not evidence of absence. For the case at hand we are not looking at real global threats like the fishing and shipping industries. These have astronomical impacts on cetaceans but are at least visible. We are focusing on military-industrial technologies and operations that are invisible and/or covert, and/or not even believed to be real in the public mind. These technologies and activities take place all over the world all the time. 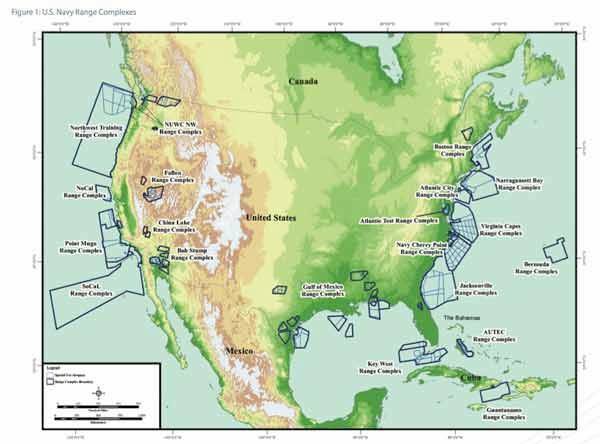 For example, over 700 seismic testing/exploration vessels exist and a high % would be in operation at any given time. Tens of millions of civilian sonar systems would exist and likewise a high % would also be in operation at any given time. Hundreds of thousands of larger commercial vessels exist, a high % of which would be afloat at any given time, each of which equipped with cathodic protection systems that electrify the marine environment. These are constant and systemic threats but non-military. Military presence in Mother ocean is not only huge but astronomically lethal, through side-effect and by design. Navies patrol and conduct surveillance throughout the territorial waters of their respective countries, but most of the ocean is an international ‘no man’s land’ where anything goes and almost everything is invisible to the public eye. Every larger country as well as supra-national organizations like NATO conduct on-going ‘war games’ which differ from actual ‘war’ only in scale. Recent ones we have covered include Talisman-Sabre off the coast of eastern Australia; Mahi Tangaroa in New Zealand; and the notorious RIMPAC, world’s largest war game, in Hawai’i. All of these have vast ecological impacts and wreak havoc on all landscapes and life-forms in their proximity. In recent years western geo-politics has adopted a strategic imperative called the ‘Pacific Pivot’, whose overt purpose is the ‘containment of China’ but whose real purpose is merely the hegemonic expansion of Uncle Sam’s imperialism. The waters of Australia and New Zealand (the 51st and 52nd states) provide convenient ‘sanctuaries’ for American/ANZAC war games, weapons testing and other military as well as industrial operations, unfettered by environmental regulations or public scrutiny and supported by economic and political solidarity. 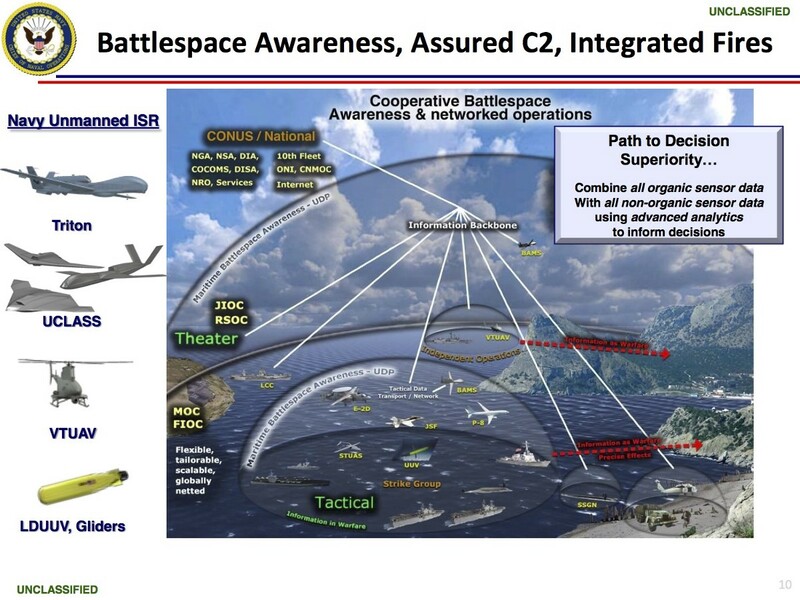 “Coalition inter-operability” is the milspeak jargon du jour, and involves not only joint war-games but also weapons testing which includes rocket and missile launches. 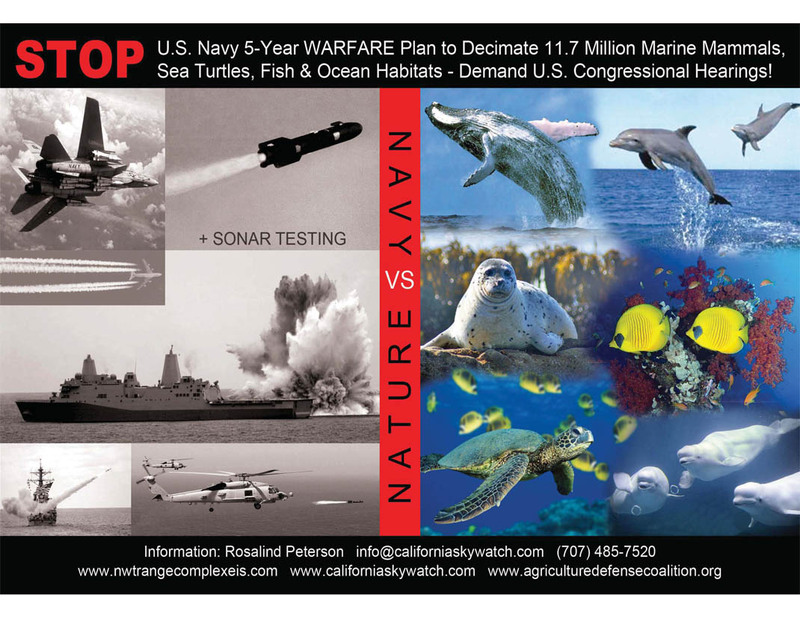 Undersea warfare is HUGE in the world of today, and contractors like Raytheon and Lockheed-Martin have pioneered a vast array of microwave technologies which are used not only for detection and surveillance, but as directed-energy weapons, or DEW’s. Submarines and of course anti-submarine warfare (ASW) are huge parts of the undersea warfare scenario, along with increasingly ubiquitous robotics and drones…AUV’s, UUV’s, Sharc’s, Wave-gliders, and Ghostfish, some of which are deployed in swarms. Finally, an army of ‘Frankensteins of the deep’ mad-scientists has been conducting a maddening array of undersea experiments designed to measure and weaponize every dimension of the structure and processes of Mother Ocean and her ‘ohana moana.’ D.A.R.P.A. scientists like Lori Adornato seek to turn marine organisms into electronically-linked ‘sensors’. 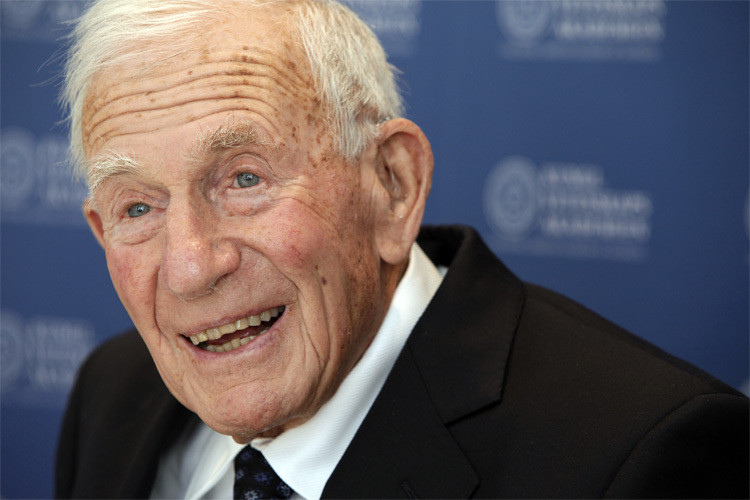 Scripps Institute grand-daddy Walter Munk (an associate of Gordon J.F. MacDonald, the mac-daddy of geo-physical warfare) came up with SOSUS, ATOC, and HIFT, the Heard Island Feasibility Test. In 1992 Munk and company broadcast an underwater signal from Heard Island (a remote sub-Antarctic island belonging to Australia) in order to see how far away it could be detected. New Zealand was one of the receiver sites, and the signals were detected as far away as Hawai’i. According to the story, this anomalous wave went unnoticed by the entire global network of seismic researchers, and no earthquake was detected in the vicinity of its point of origin. 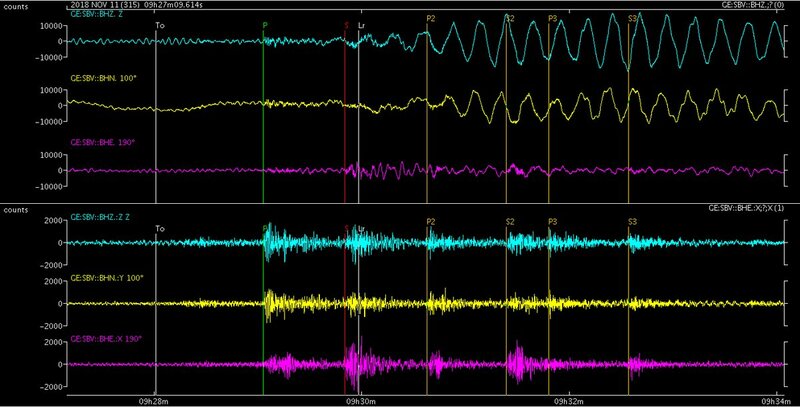 It was seen by a lone amateur from Wellington, New Zealand on the USGS live seismogram page, who brought it to the world’s attention. 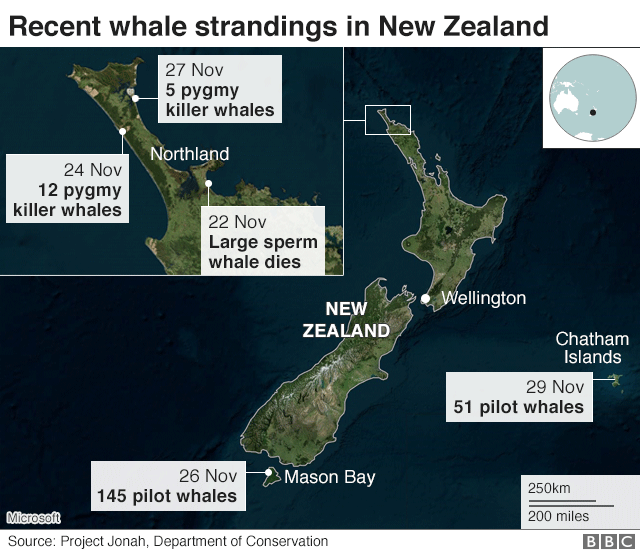 Once again, the “experts were baffled” just as they were by the highly anomalous multi-species cluster of whale strandings spanning three countries and over 2300 kms all occurring in less than five days…perhaps the largest stranding constellation ever witnessed. And these whales are just the ones we found out about, and may represent less than 10% of all cetaceans affected by this…event? This stranding cluster took place in a context where all ‘natural’ influences were present, as well as the full spectrum of anthropogenic military-industrial influences whose proximity cannot be determined, and many of which are classified/unknown. With the centrality of Australia and New Zealand to the ‘Pacific Pivot’, the shift of U.S. military presence to the southern hemisphere, and increasing militarization within the ANZAC coalition, the Trans-Tasman region and EEZ’s of both Australia and New Zealand are hosting a vast array of covert undersea warfare activities as well as geo-physical experimentation and exploitation. Microwave technologies figure heavily in all of the above. This stranding cluster could be related to the ‘mystery wave’ and its precursors and after-effects. Surface and undersea vehicles, manned and unmanned, could have been involved as part of the network of signal transmission. The operation/experiment may have been for both military and industrial purposes. H.A.A.R.P. 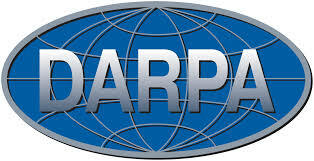 technology (which has now been miniaturized and forms an integrated global network of transceivers in terrestrial, marine, atmospheric and low-orbital space environments) can simultaneously be used to detect weapons and vehicles, damage or destroy them, enhance communication, including submarine, while disrupting that of the ‘enemy’, and look for mineral deposits via Earth Penetrating Tomography. All with the same ping. Occurring in conjunction with or separate from the ‘mystery wave operation’, surface and/or undersea warfare activities using microwave and other directed-energy weapons as well as more conventional sonars, torpedos and missiles, involving any number of vessels could have triggered these strandings. With GPS jamming exercises an integral part of ‘war games’…or actual warfare…plus the fact that the whales who washed up in Victoria were already decomposing, meaning that they were killed at sea. WHAT IS REALLY GOING ON IN THE WORLD OF TODAY? Psychologist Carl Jung coined the term ‘synchronicity’, and the title of his book is Synchronicity: An Acausal Connecting Principle. Synchronicity IS in the perception of the participant/observer, and may or may not demonstrate or imply any kind of ‘causal’ relationship between events experienced together in time. Everything happening together in time is by definition ‘synchronistic’, but some co-temporaneous events seem to be more than just ‘coincidence.’ Some may show direct causality, some may be omens, warnings, or messages. If a falling rock hits your foot, then your foot suddenly hurts, this implies a causal relationship. If you’ve been thinking of someone near and dear who you haven’t heard from in years, then all of a sudden you receive a letter from them, this is a meaningful synchronicity…to you but to no one else. If your foot suddenly swells up painfully, you can be sure that you probably were stung or bitten by an unknown critter, even though you didn’t see it. If we see hundreds of whales beaching themselves and then notice that naval war-games, rocket launches and seismic exploration was happening in the same area, this implies causality. But what if we don’t see the war-games or undersea activities? They are covert and cloaked by design. ‘Plausible deniability”? This describes not only our inability to come to grips with not only whale and dolphin strandings as well as a LOT of what is happening in the world of today, but also how our perceptions are being molded and engineered. 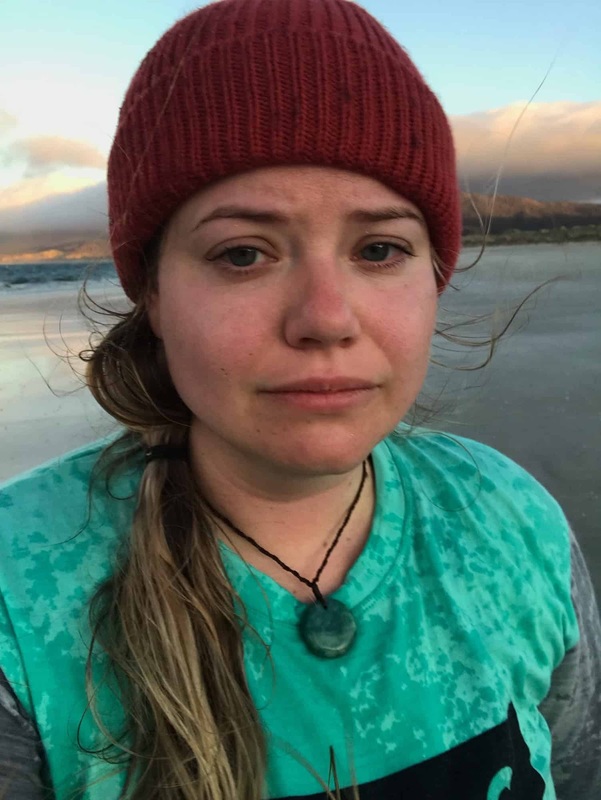 Imagine the shock, horror and sadness that Liz Carlson and her friend experienced a week ago when they came across 145 stranded pilot whales at Mason Bay on Stewart Island, New Zealand. This synchronicity may be as profound and transformative in their lives as being at Big Mountain in Arizona learning about koyaanisqatsi and the Hopi prophecy on the day that the Chernobyl meltdown happened in the Ukraine was for me. Humanity as a whole is not compos mentis. Our species alone among Mother Earth’s myriad children has forgotten who we really are and are doing our utmost to wage a full-spectrum war on life as we know her. Yet we somehow convince ourselves that we are ‘saving the whales’ by donating money to Greenpeace from the comfort of our five bedroom holiday home. MAY THIS STRANDING CLUSTER HAUNT US ALL. And who will euthanize US when ‘man, the wise’ strands on the beach of reality?